The largest and main chamber of the heart is the left ventricle and, unfortunately, left ventricle hypertrophy is a serious matter that can happen to you. The left ventricle heart chamber pumps blood that is oxygenated into the aorta (the largest blood vessel that delivers blood to tissues throughout the body). When ventricular hypertrophy occurs, the muscle of the chamber enlarges. Because of the increased thickness, blood supply to the muscle itself may become inadequate, which can lead to heart attacks or heart failure if gone unnoticed or untreated. While left ventricular hypertrophy is not necessarily a disease, it is usually related to many other heart diseases. One of the most common causes of left ventricular hypertrophy is high blood pressure. The extra work of pumping blood that hypertension demands against pressure in the heart causes the left ventricle to thicken up over some amount of time--like how a muscle would thicken up after weight lifting for a long period of time. If you are morbidly obese, you are at a higher risk to develop heart issues and suffer from left ventricular hypertrophy symptoms. Stenosis is the narrowing of the aortic valve which is the flap type piece that separates your left ventricle from the aorta. Then the large blood vessel should deliver oxygen-rich blood to your body. However, due to the partial obstruction of blood flow, the left ventricle has to pump harder to transfer more blood to the aortic valve, which proves to be a strain. 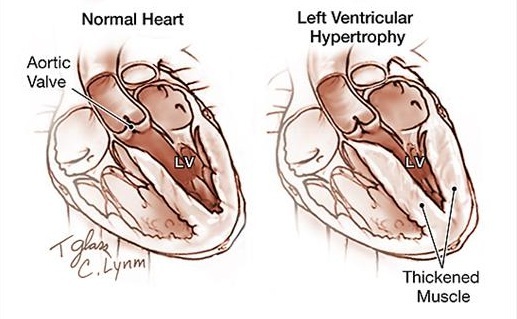 Hypertrophic cardiomyopathy is a genetic disease that can lead to a different type of left ventricular hypertrophy. This genetic disease slows blood flow to the aorta because of having an overgrown heart muscle. If you go from not doing any athletic or difficult exercises to long winded exercises, you will be highly likely to put a lot of strain on not only your body, but your heart as well. This can lead to left ventricular hypertrophy. Make sure to research exercises fully before you begin doing them. The left ventricular hypertrophy usually develops over time. Most of the ventricular hypertrophy symptoms occur when the condition begins to cause complications with the heart and body. The most common symptoms of left ventricular hypertrophy are: shortness of breath, pain in the chest, heart palpitations, dizziness which then leads to fainting spells. The left ventricular hypertrophy condition can be diagnosed based on a physical examination by a physician or doctor. Doctors will look at your family history during the examination to see if your family members have a history of heart failure or heart diseases that may have led to left ventricular hypertrophy. They will also perform an x-ray on your chest to see if your heart may be enlarged or if there is any other noticeable blockage. According to different causesof your left ventricular hypertrophy, your doctor may suggest some medications, and in extreme cases, surgery. The majority of treatments for high blood pressure will include changes to your lifestyle. Your doctor will suggest that you exercise regularly, start a diet that is lower in sodium and fats.If you are a smoker, cut out cigarettes. Hypertension medications can be taken in order to deter any additional enlargement. To name a few blood pressure medications: thiazide diuretics, beta blockers, and calcium channel blockers. For those who are already diagnosed with sleep apnea, treating this disorder can vastly shrink the potentially developing, or already developed, left ventricular hypertrophy condition. Sudden major changes in your sleep pattern, such as insomnia, loud snoring, or sometimes lack of breathing are causes for concern and mean a possibility of sleep apnea. In order to treat sleep apnea, you will be given a machine that provides a continuous airway while you are asleep so that you can keep breathing normally in the evening. When the left ventricular hypertrophy condition is a result of stenosis of the aortic valve, you may need to have surgery in order to remove the valve and have it replaced with either an artificial valve or one from similar tissue in a donor. Those who also suffer from aortic valve regurgitation may need to have the valve replaced surgically. Even though you may think that you have fine cholesterol and that medications which lower cholesterol are not going to help you, they can actually help fix your left ventricular hypertrophy. There are currently clinical trials being performed to see if cholesterol-lowering medications will work to help people who have the ventricular hypertrophy condition. By losing weight in a healthy way you will lower your risk for left ventricular hypertrophy, as well as other heart diseases. By just eating a well-balanced diet and exercising regularly, you can prevent the fatty blockage to form in your heart region. If you are too dedicated to the normal seasoning salt, limit the amount that you use when cooking. This will help keep your blood pressure at a steady rate. Alcohol is terrible for your body, especially your liver and your heart. If you do not want to fully give up alcohol, begin drinking in moderation and limiting yourself to one or two drinks every once in a while, rather than getting drunk. By adding thirty minutes of cardio exercise to your daily routine, you will lower your risk of heart disease immensely. Maybe instead of driving to work you can walk, or even go to the gym for a cardio workout. If you suffer from high blood pressure, invest in a home blood pressure device that you can use to check and monitor your blood pressure frequently. Schedule regular checkups with your doctor, or you can even use the free blood pressure tests at your local pharmacy. Keep in mind that the target for healthy blood pressure is less than 130/80 mm Hg.